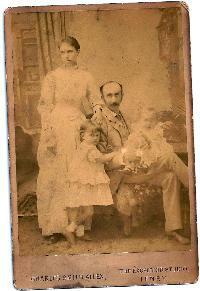 Studio portrait of John Tucker Collis with his wife, Ethel Constance [Walker] and their two daughters, Constance Mary [born 1884] and Ethel Dorothy [born 1886] taken by Charles Smith Allen, The Excelsior Studios, Tenby, where they may have been on holiday. They lived in Clifton, Bristol. he was a commercial traveller from Fleishman and Cox, pharmaceuticals.